This is a tricky one, there have been a lot of people who have had a great impact – friends, parents, colleagues, so I’ve chosen the event that had the biggest impact on me. 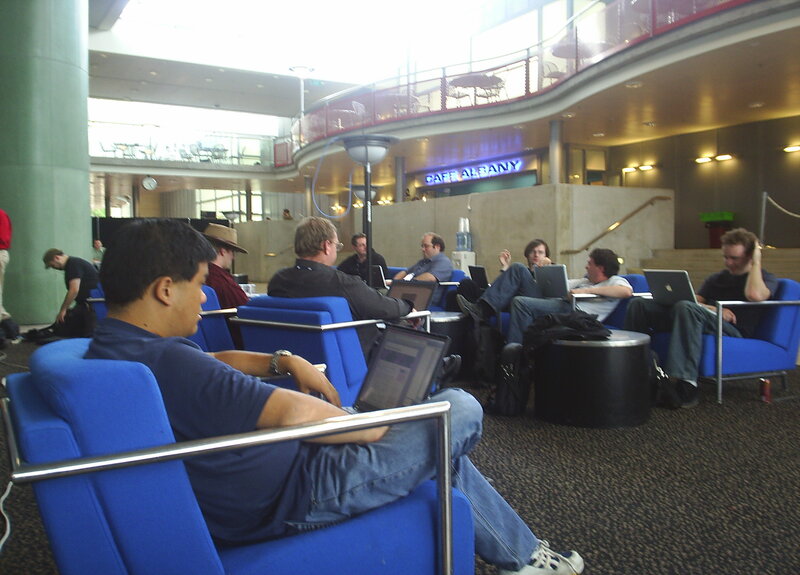 This picture is from linux.conf.au 2006, which was the very first linux.conf.au I ever attended, held in Dunedin NZ. I had just left college and was looking for a job in IT at the time, planning to sit my RHCE in a couple months (which I did and passed), before taking my first job. To say that linux.conf.au blew my mind, would be an understatement – before then I was a geek sitting in my bedroom, compiling linux systems from source and attending college with a bunch of time wasters – at linux.conf.au, I realised that I wasn’t alone and that there were hundreds of ubernerds like myself out there. Dozens of new friends, some whom I still talk to on a semi-frequent basis. Realisation that most geeks are a pretty friendly, awesome bunch to hang with. Discovered, it’s normal to sit around on your laptop all the time. Knew that I was on the right path with a life in IT. But linux.conf.au also served as a point in my life where I formulated my ideas regarding ethics, open source, freedom and many of the views that I hold to this day. Probably one of the most memorable experiences in my life – I still go to linux.conf.au every year and it’s still my most favourite week of the year and I always come back feeling excited and renewed with awesome ideas. Awesome. That’s exactly how it should be! Well done, Jethro! I was there too. It was an awesome week. And it was the week my MSCE card delaminated in my wallet .. a sign I’m sure! It wasn’t long after that I changed jobs from a MS centric place (and going deeper down that rabbit hole) to one where open source is the norm and closed, legacy OS are frowned upon.